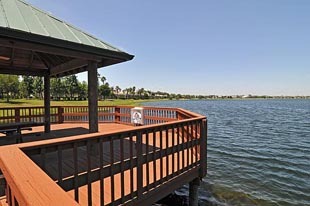 The Moorings at Edgewater is a deed-restricted community on a 17-acre peninsula that juts out to the 160-acre Lake Uihlein. Situated near Lakewood Ranch Town Center, condos for sale in the Moorings provide the best option for prospective home buyers who need to be near the commercial area. Moreover, the community is very near University Parkway and I-75; residents can easily reach the airport, the gulf coast beaches, and downtown. The Moorings real estate comprises 136 carriage homes in 34 buildings. Each building has four units—two on the first floor and two on the second floor. Floor plans range in size from 1800 to 3200 square feet, with price tags between the $350s and the $640s. You can expect stunning lakefront views from several Moorings condos for sale, especially those located on the edges of the peninsula. The Moorings at Edgewater has an active community with its own clubhouse, a resort-style pool, and its own private island. The clubhouse has a large multi-purpose room and a small meeting room, a cozy library, kitchen, restrooms, and an exercise room. There are numerous activities scheduled for residents, including Mahjong and Movie Nights. You can relax by the community pool, enjoy the spa or maybe have a barbecue; there is an outdoor grill in the pool area, as well as a tiki bar. Inside the clubhouse, you can play billiards or simply watch a movie on the widescreen TV. There is a pavilion on the lakefront with beach chairs, where residents can enjoy the soothing lakefront panorama. The Moorings’ little recreation island has small boats for kayaking and fishing, garden sets for picnics on the island, and a sandy trail for leisurely strolls. Residents regularly have cocktails on the bridge every Saturday at 5 pm—a great way to mingle with the neighbors while watching the spectacular sunset. In addition, the Men’s Breakfast is held at 9 am every Tuesday at the Serving Spoon on Main Street. For more fun-filled activities, just head to Lakewood Ranch Town Center’s Main Street. Cafés, bistros, grills, and sushi bars line its picturesque walk. Shop inside the boutique-style stores or simply enjoy the First Friday Music on Main. The Lakewood Ranch Cinema is also located at the Town Center and just a short stroll from The Moorings. Across the community is the hospital complex, where residents can avail integrated in-patient and out-patient services from the 120-bed acute care Lakewood Ranch Medical Center and adjacent Medical Office Building. The Town Center has a miniature golf course, The Fish Hole. 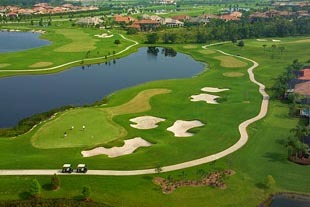 For the real thing, residents have a choice of three 18-hole golf courses at Lakewood Ranch Golf and Country Club. Cypress Links, King’s Dunes, and Royal Lakes were designed to suit all playing levels and pose challenging games to both beginners and expert golfers. The scenic surroundings and the diverse social calendar make up life in this small community. If you want to be part of this convenient and very active lifestyle, then take your pick from the available condos for sale in The Moorings. It’s every bit as enchanting as you think, and even more exciting than you expect. Below are all of the current real estate listings available for sale in The Moorings at Edgewater.